LAS VEGAS- The (r)evolution of privacy in technology was tweeted tonight at the Develop 4 Privacy awards at the DEFCON 19 hacker conference in Las Vegas. "The Revolution will be Televised... by hackers in their mother's basements." BTC --CNET's Declan McCullagh and Elinor Mills discuss breaking news filtering out from annual federal-private hacker conferences Defcon & Black Hat. The Reporter's Roundtable converges about Operation Shady Rat, private robotic drones, the relevance of Smart Meters, facebook's facial recognition technology risks in social networking and how Apple batteries and medical insulin implants can be hacked. The Driver License: Is It Necessary? Is Your Local Law Enforcement Tracking Your Cell Phone's Location? 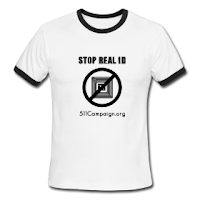 I represent a group of citizens in Florida that are opposed to the federal REAL ID law. 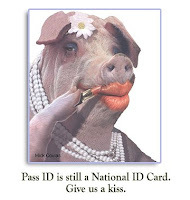 A friend sent me your recent posting regarding Kaye Beach fighting REAL ID in Oklahoma that is located here. I wanted to add some other concerns that were not addressed by Ms. McNeill (formerly of the Heritage Foundation and now apparently a congressional staffer) or brought up in the original posting. I have a law enforcement background, and spent the final 5 years of my career with the Florida Highway Patrol in the Bureau of Investigations, which handles ID theft and driver license fraud investigations. I am well aware of what it takes to investigate fraud, having done so for several years. 1) The 2005 federal law is unconstitutional- Congress does not have the authority to tell the states how to issue their own driver's licenses under Article 1 Section 8. The 10th Amendment reserves this power to the states. By requiring the states to seize personal papers without cause or a warrant, it violates the 4th Amendment at the state level. One of the reasons why we have a mountain of debt and a federal deficit each year is the unconstitutional expansion of the federal government. REAL ID is one such example. The fact the original bill (HR 418) couldn't be enacted on it's own and the act had to be snuck in with a defense authorization and Tsunami relief bill speaks volumes as to the validity of it. Like any unconstitutional law, it will remain on the books until someone with enough money comes along to challenge it in court or the state legislatures address it as a sovereignty issue. 2) While there is not a single database, the several databases are in fact linked, and all documents scanned are in them. This is similar to placing all of your money in one bank with several branches. If hackers infiltrate one, they can compromise the remainder, and all information is compromised. There is a second concern regarding employees that have access to all of this data. Any system is only as secure as the person that has access to it. 3) The 2005 law (HR 1268) contains the phrase "federal identification" in Section 202 (d)(11)(A). This is a prima facie instance of the function of a national ID card. If the federal government wishes to issue ID cards for the first three stated federal purposes under Section 201 (3), they should do so instead of passing the buck to the states for the dirty work. 4) The 2005 law in Section 201 (3) gives unlimited power to the unelected Homeland Security Secretary in the fourth stated purpose as to when a REAL ID can be required. 5) REAL ID as implemented will not prevent fraud. We saw this recently here in Florida when a Deputy Sheriff stopped a vehicle and the driver, wanted for murder out of state, produced a REAL ID license. Read the news story here. It's still a relatively simple matter to dummy up a few documents and obtain a REAL ID. 6) The law has cost the taxpayer over $10 million here in Florida since 2008 (DMV figures when I inquired). It has yet to identify one illegal alien or terrorist. The "federal" money did not cover all expenses. The DMV representative told me it was $7.22 million in "federal" money and $2.95 million in state money. Keep in mind over 90% of all federal revenue comes from the taxpayers, so there is no such thing as "federal" money in the amounts commonly referred to. 7) I speak about this issue to area groups in North Florida. I hear first hand how it has affected people. One older woman told me she had to spend $400 to legally change her name just to renew her license. The law causes a number of hardships for women that have been married and divorced. After it was implemented here in January 2010, a lady wrote to the Tallahassee Democrat how she could not renew her license due to a county in Georgia losing her divorce paperwork from 30 years ago. The law has also had the undesired consequence of invalidating state-level protective laws for police officers, judges, and domestic violence victims, all of whom do not want their residential address on their license and used to have it protected under state law. 8) Heritage held a conference on this issue in June 2011. They failed to have any qualified opposition present, such as Jim Harper of the CATO Institute. Looking at Heritage's own publication regarding the several failed terror plots since 9/11/01, one sees there is no linkage whatsoever to state driver's licenses and these plots being prevented. The plots were prevented by courageous airline passengers and good lawful police work. In many instances, the suspects involved likely qualified and may have held a REAL ID compliant license. The report is located here. I have written about the Heritage Foundation on this issue recently here. I have a page devoted to some common myths about REAL ID here on our website. My contact information is below. I would enjoy speaking to you on this issue, as there are many more points of concern.